Sophisticated and airy with its pervading light. Fitting in and standing out – simultaneously. The nest of the perspective-thinking person is out there. Far beyond uniformity and everything flat and predictable, Diamond surprises and impresses with its vision. A building without a representative facade and back but magnificent in every aspect, just like a diamond. Classic simple and modern provocative building, impressive, refined, firmly situated on the ground, but also gazing at the sky.The glass surrounding takes away from the feeling of massiveness. The sun rays can penetrate through the windows, but the building can as well become a mirror that doubles the sun and the moving clouds. The vast terraces remind us that a home is not only walls and space where you can isolate from the outside world, but also a place where you can enjoy the morning freshness and beauty of the sunset. Everything is on display in DIAMOND BUILDING – it reflects the sky, the clouds, the rays of sunsets and sunrises. The glass surfaces relieve the sense of burden and create a sense of impressiveness, airiness and ease. The silhouette radiates energy, creates a stimulating environment for living. Every window offers endless panoramas that elevate the thoughts and broaden the outlook. Modern people need a place where to feel protected and calm, but also an environment that opens them to the world where they can fit in. DIAMOND - innovative aesthetics that revive good feelings and fill with energy and determination. The building is on the exact place: in a modern capital city. The vertical and horizontal space gives opportunity for stunning interior decisions, inapplicable for any other place. DIAMOND gives another perspective for everyday life: with its prestigious address, with a way of life without ordinary everyday care, with its incomparable panorama. In Sofia as it should be - priceless! 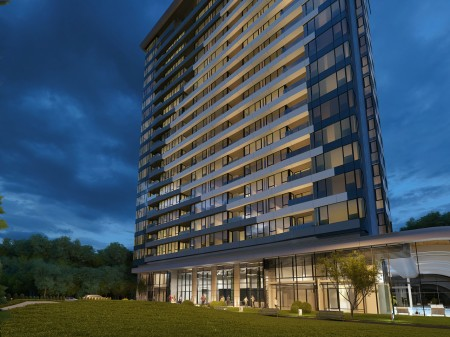 With its new project DIAMOND Building, ARTEKS ENGINEERING is challenging the creative genius of all – architects, designers, builders and future residents of this innovative building. In Sofia, people don't search for peace and isolation, but rather for everyday dynamics, incomparable opportunities for contacts and the stimulating feeling of being part of one pulsating world. It is natural that an active person, living in a vertical city would expect to have everything necessary for his job and relaxation. This is the reason why all the apartments start from the fifth floor. Up to this floor are the open spaces of the huge lobbies and in front of them are the unique outdoor gardens, cozy places for business and meeting friends, the children's playgrounds and the SPA center. 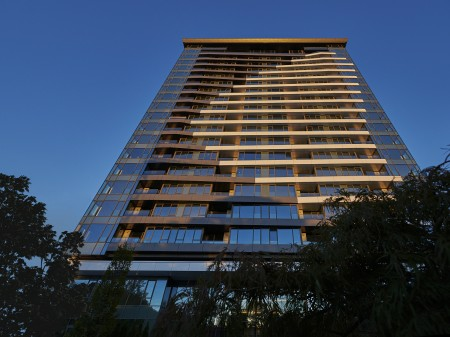 ARTEKS buildings are not ‘an island of prosperity’, but they enrich the environment with improved infrastructure, special lighting and landscaped green areas. The old prejudice about high-rises will be eliminated by buildings such as DIAMOND, which will reveal how luxurious, nice and healthy living in them can be. Situated in the most favorable terrain, built with materials of proven origin, using the most modern technologies, your home here is not only magnificent and sunny, but also heat and sound isolated with low power consumption. We should remember that a home in a compact and shared environment needs less resources than one scattered on a big terrain. Care for man and nature here is not just a wish or slogan, but it is incorporated in each and every step of the project. Why DIAMOND? Some may associate the name with the phrase “Diamonds are forever” or “ Diamonds are girl`s best friend” and they will probably have in mind one always young girl - Sofia. Or they may see the mixture of sun rays playing on the surface of the building, which enchants us just like a high-class stone. Or one may think about the exquisite solidity, stability and immortality of a diamond? And perhaps with its creation ARTEKS ENGINEERING reminds us that when you give a diamond you symbolically promise purity, light and devotion. A breath of clean and fresh air- this is the beginning of a new healthy lifestyle. There is no substitute. The really good technologies are humane. They interact with nature, they complete nature and even when necessary they create nature where it is not sufficient for a person. People who are truly concerned about the quality of their living environment invest in it, so that it is in conformity with nature. With Diamond Building Arteks Engineering presents their customers the vanguard, the proven best in residential construction. Often we describe our desire for relax, ease and satisfaction with expressions such as ”get a breath of fresh air”. 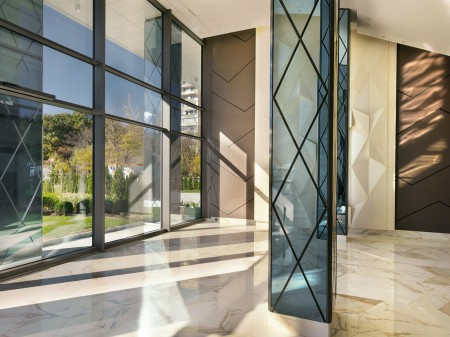 Diamond Building proves that in the heart of the dynamic and crowded city of Sofia we are able to breathe with ease, which is sometimes possible only among nature. And even without fear of allergen. Excellent insulating materials, flawless gasketed doors, high quality aluminum windows. 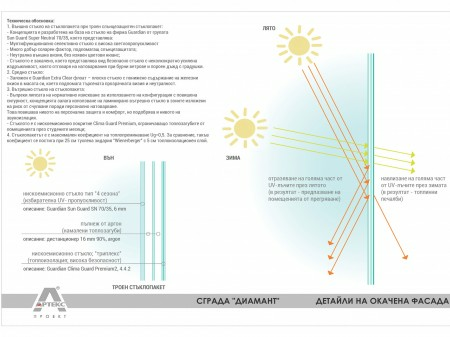 All this provides adverse effect protection, low energy consumption, reduced costs. The key to all the freshness are the innovative recuperation systems of the air. They are based on the idea that a modern building should be able “to breathe”! It is not sealed from the outside world, it is built in with a filter, letting in only things which are healthy. Recuperation is a process of controlled mechanic ventilation: exhaust air from the rooms is output and filtered in a way that protects the environment. Its temperature is used for warming and cooling the imported from the outside air. The two air streams never contact with each other. This thermal interaction prevents from losses. The high quality recuperation systems save more energy than they use. They are economical and environmentally friendly. The air which is led in the rooms passes through a fine filter system, so that all pollen and harmful gases can be removed. Now you are free of unpleasant odors and stagnant air without constantly having to open the windows to get fresh air. These homes, always filled with fresh air, are loaded with mountain freshness. They are particularly suitable for children and people, who are prone to allergies, bronchitis, asthma, etc. Using the recuperation systems, the micro-climate is improved with minimal energy consumption, with an incomparable positive effect and with no discomfort. The fresh air is supplied from grates above the doors, so that it is guaranteed that the closed doors do not stop the air stream. Designer solution of heating system in a living room - 36 cm height (to the lower edge of the windows. They do not hide the panoramic view. The height of the project allows building-in of a recuperation system, ensuring fresh and purified air supply through specially designed door gratings in each room. The biggest height of the room 2.88 allows fixing grates above the doors, which supply fresh and purified air from the recuperation system in the halls. There is a plan of a suspended ceiling- necessary for building-in of a recuperation system for leading fresh and purified air in each room.